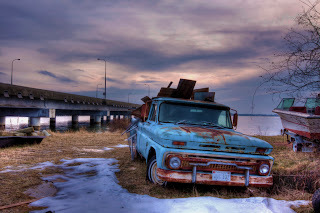 This dilapidated, old truck sits beneath the bridge on the banks along the Choptank river in Cambridge, MD. After passing by this subject on many fair occasions, I picked, finally, a cold, brisk winter's day to make my approach. Five exposures at 2ev spacing. Processed in Photomatix 3 and PS5.